(L-R) Bob Schmidt, Michael Dura, Tina Brock (front), Tomas Dura and David Stanger in Eugène Ionesco’s Rhinoceros. Tina Brock, writer, actor, co-founder and producing artistic director of the Idiopathic Ridiculopathy Consortium (IRC) since 2006—Philadelphia’s only absurdist theater company—studied at the University of Maryland and West Chester University; she is a Case Developer at the National Board of Medical Examiners. She makes the impossible possible, year after year, with some of the most thought provoking and unusual productions. Few people, other than IRC actors, know that (in spite of her shoe string budget) she goes all out to further awareness of the Theater of the Absurd. She coordinates trips for colleagues and ensemble members to New York to see rarely-produced absurdist plays. In her widely reviewed production of Ionesco’s Rhinoceros, she talked openly about her approach to directing and the actors in her widely acclaimed new production. Henrik Eger: Ionesco’s RHINOCEROS is not an easy play. How did you go about casting for it? Tina Brock: The script is hugely demanding, textually and rhythmically, so I selected performers who were firstly comfortable with the technical and emotional demands of the work, and then positioned them in roles to highlight their individual uniqueness. You can’t play interesting. Actors are interesting through what they bring to the table and what they deliver to the audience. To create this town, we wanted as varied a representation of height, size, vocal quality, and physical ability as possible to create a picture of a unique and somewhat eccentric, but representative, group of citizens. HE: Before the invasion of the herd of rhinos, the people in the little town argue a lot over trivialities. How does this play, written in 1959, relate to an audience in 2014? TB: The “clump” of humanity huddling together, from many different walks of life, says something about the world today, and gives the audience the foundation for and illustration of the group’s positions in the philosophical debate. HE: Your Idiopathic Ridiculopathy Consortium (IRC) is probably the only Philadelphia theatre company that specializes in the Theater of the Absurd. That brings with it some freedom but also, perhaps, some restrictions. TB: In our productions, we can take casting risks that aren’t feasible in realism—men playing women, women playing men, you name it—it all flies as long as there is a logic behind the choices. You cannot play absurd–it’s real people in unreal situations, so we can define the terms. There’s nothing to compare it to. It helps if you tip off the audience that “this is an absurd situation, it’s OK to laugh” by introducing actors with wonderful unique qualities who they might recognize as an eccentric neighbor or aunt. HE: How did you work with Ethan Lipkin, who played Berenger, the main character of the play? TB: I felt most connected to Berenger when he doesn’t feel sorry for himself, but stated [his feelings] as a matter of fact that required acceptance and understanding. That seemed like a gateway to understanding people different than ourselves. I was interested in the person who wears his emotions on his sleeve, who shares how he feels, and often how we don’t accord confidence to that person. Ethan and I didn’t agree on this key issue at first and many discussions took place about Berenger. I was hoping we could both achieve something we could be happy with. I loved the teddy bear quality about Ethan. He is, for me, an actor/character that audiences can identify with. Because the characters are broadly drawn on the page, it is possible to interpret the lines in opposite or distinct ways. There are dramatic reasons, as a producer, for having Berenger be in search of meaning and on an active journey. This play needs to keep the sense of the absurd and insane circumstances that hold it up. HE: Could you give some examples? TB: Jerry Rudasill [who plays Pappillon and the Waitress] is skilled in physical comedy and moves quite well. He enjoys wearing bold costumes and using props. Since the Waitress is a comedic part, it seemed right to pile on the challenges for Jerry. High heels, a huge wig, a tray with flying glasses and plates, those are challenges Jerry handles well. I wanted a sassy waitress who was very emotional to be able to have a conflict between her and her boss who is always condescending to her. By making her strong and emotional, she could be funny; we could laugh at her because she’s strong enough to take it. At the other end of the cafe block is the cafe proprietor, played by Bob Schmidt. In dress rehearsal, he was suited up as the owner of a dusty Italian cafe, but that seemed out of sync with the waitress Jerry Rudasill was bringing to the table, so [Costume and Scenic Designer] Erica Hoelscher and I went back to the table and came up with the aging rocker, all leather and chains. There’s a rock star in all of us, so that one was an easy assimilation for Bob. [Brothers] Michael and Tomas Dura enjoy working together. They both have a very wry, droll sense of humor, and are hilarious as counterpoints in this play with all the adjunct hysteria going on. They have been cast before as two doddering aunts in Ivona: Princess of Burgundia. Last year, they played the K’s nincompoop twin assistants, who can’t get anything right, in Kafka’s The Castle. HE: Tell us about Jean, whom Ionesco wrote as the dominant character. TB: David Stanger [as Jean] is very easy to work with on this material. His technical instrument is well-honed. His vocal quality, breathing, physicality, and emotional work are at such a pitch that there’s little ramping up to be done—it’s more a sculpting process with David. He’s worked on many shows with IRC and understands the trajectory of how our shows are built, so there are no surprises for him or for the director. HE: How did you and David manage to create the perfect dandy? TB: Erica Hoelscher actually had a real New York dandy in mind, who reminded her of Jean, when designing the costume. In this case, she steered David to this socialite’s website to give David an idea of the visual, outer representation as we saw him. HE: How did you envision the townspeople and the rhinos? TB: When directing, I envisioned the rhinos roaring by as a manifestation of the townsfolk’s inability to properly integrate their emotions—to the point where they boil over and consume, polluting the gestalt. The townspeople have little ability to think or feel for themselves–everyone asks the other what they thought of the events. The Housewife feels grief over the loss of her cat; they offer Cognac as a solution because it makes them uncomfortable. The tamping down of feelings and emotions can’t come to a good end. It consumes each in the end and takes the town down as well. HE: I heard you are “tweaking” the production while the rhinos are on their run. TB: I feel you’d have to do three weeks of previews to be ready to open this show–we had three [nights]. We learned a great deal in those three nights. I’m a director that continues to watch and give notes that can keep the show aloft. I’m really more a conductor than a director with this material. It’s very musical and has a definite rhythm—when it’s off you can really tell. So a lot of the notes are about intention and pacing that comes out of that. It’s about the action that comes from the feeling. So regardless of what you start with, there’s no room for contemplation—these characters are only reacting, not steeped in thought. They are at a fever pitch of anxiety, which is one of the issues I was examining, and how this anxious contagion spreads from character to character. It’s my job to keep the Rhino in the pen, so it doesn’t cut loose and trample the town. HE: And you did—with great success. 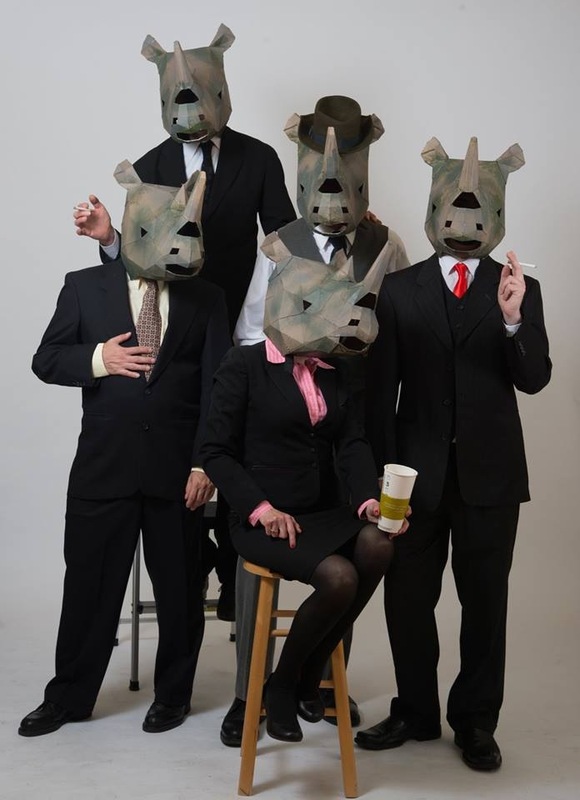 You can see RHINOCEROS at the Adrienne Theater, 2030 Sansom St. Sept. 2-21, 2014. http://fringearts.com/event/eugene-ionescos-rhinoceros-18/.